LOS GATOS…I’m really a dog guy. In fact Annie (she goes in for surgery on Wednesday, sigh) is tucked in next to me on the couch as I “work”. Sshh, don’t tell the child bride. Anyway, these kittys are a little different than your average evil, overfed, over pampered tabby. They are wild cats. 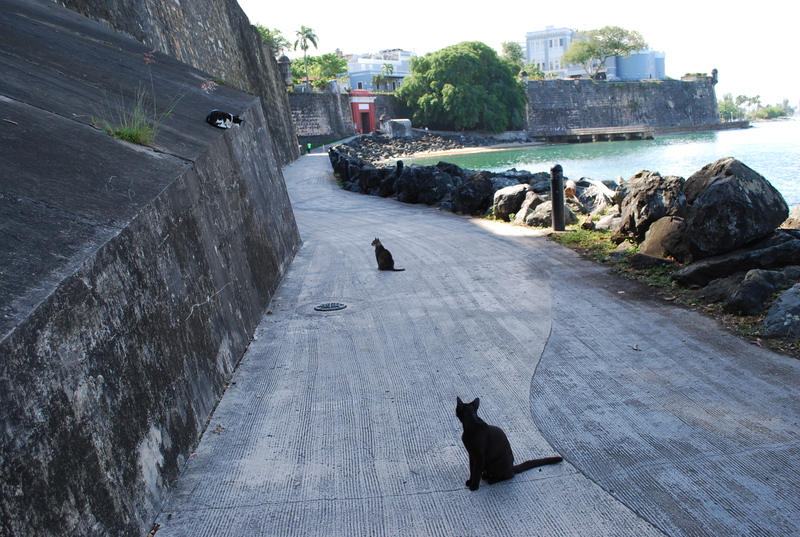 No, not those kind of ferocious wilderness stalkers, these guys survive along the shore and around the high stone walls of the colonial fort guarding the entrance to San Juan (Puerto Rico for those of you in Rio Linda or Tamaqua, PA) ON THEIR OWN. No Friskies for them, it’s mouse or iguana or go hungry. They are “protected” though the looks they gave me made me wonder who really needed that protection. Here are only three of the DOZENS I saw on a recent trip. This entry was posted in Author, cats, humor, photography, travel, writing and tagged author, cats, humor, photography, travel, Writing. Bookmark the permalink. Oh, I think everyone should consider having a cat allow them to stay in the same house. Great teachers of humility and patience. Dogs however, are just happy to be tossed a scrap now and then and finding the toilet seat left up.